You can’t do much better than sweeping the girls and boys team titles in the season-opening event. 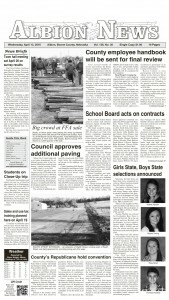 The Boone Central Cardinals pulled off that feat Tuesday, March 27, at the Madison Relays, both totaling 88 points. The Cardinal boys edged Logan View by two points, while the BC girls easily outdistanced runner-up West Holt (56). 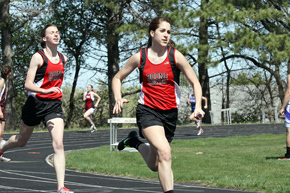 “The weather was a little warm in comparison to past Madison Relays, but our kids, both the boys and the girls, started the season very well by winning both divisions,” said Cardinal Coach Kris Pestel. “We began the season with some solid performances, but we still have room for improvement. “So far this spring, I have been very pleased with our work ethic and our athletes being coachable in all events. Both Cardinal teams showed impressive balance in the meet, scoring points in nearly every contested event. Boone Central had five first place performances, five runners-up and five third places in the boys division, placing in all but one event. The Lady Cardinals notched six firsts, five seconds and two thirds, missing placing efforts in just two events. Boone Central victories in boys competition came in the 195 meter hurdle shuttle (Hallick Lehmann, John Kennedy, Nick Paulson – 31.3), distance medley (Carter Johnson, Tony Krohn, Brody Kelley, Calvin Koziol – 11:55.8), high jump (Cole Luettel, Derek Gentrup, Travis Kennedy – 17’2), triple jump (Luettel, Parker Struebing, Lehmann – 114’9½), 3200 meter relay (Krohn, Kelley, Koziol, Trevor Salber – 9:26.1) and 3200 meter run (Nathan Schriver – 11:55.1). The Cardinal girls snared their wins in the 800 meter relay (Breann Thorberg, Dana Pelster, Kaitlyn Stuhr, Jaime Kennedy – 1:54.9), discus (Kattie Cleveland, Maria Glidden, Nancy Moncada – 291’2), shot put (Cleveland, Glidden, Liz Ketteler – 98’9¾), sprint medley (Olivia Slizoski, Aleana Hager, Thorberg, Kennedy – 2:00), triple jump (Terri Molt, Miranda Ketteler, Rachel Lee – 89’5½), 400 meter relay (Hager, Pelster, Kennedy, Thorberg – 53.45) and 1600 meter relay (Thorberg, Stuhr, Miranda Ketteler, Kennedy – 4:31.3).